Pressed for an answer, the young Filipino American conceded that the food was okay as far as he was concerned. However, in a talk with PinoyWatchdog later, Karl Pascasio reiterated his reservations. He wished there were more choices such as, for example, Filipino food. The teenager came to the U.S. with his parents in 1999 and had visited his birthplace, Quezon City, four years ago. He still speaks the mother tongue and “comfortable with the food of my country.” “My country” being the Philippines. More than 100 Filipinos attend the Bravo Middle Magnet High School in Los Angeles, he said. He and another Bravo student, Kristina Galstyan, were in the panel that morning to offer the youth’s perspective about the school district’s new program to improve the eating habits of students. The Los Angeles Unified School District (LAUSD) takes on child nutrition beyond lip service and goes the extra length to make food not only good for the health but acceptable to the palate of kids. The second largest school district in the U.S. is making improvements to school lunches in ways that students consume familiar-looking food without knowing that it had been modified to carry extra nutrients. It is a wellness program intended to achieve a win-win goal on both the kids’ well being and for the school. The district is banking on a study that well-fed students are less likely to dropout; and that they are more focused in their studies and perform better throughout the day. The motto being better eating, greater learning. That would do well for the academic standing for the school — in addition to the fact that greater attendance means more revenues for it. There is a study indicating that many factors may contribute to the growth in childhood obesity such as “junk” food, large portions, soda consumption and less exercise. LAUSD takes pride in the fact that in 2005 it pioneered the banning of soda and chips in the school vending machines. The district also has done away with MSG, palm oils, trans fats — and introduced whole wheat, brown rice and vegetarian entrées. In the current food program students are offered the option of meat or meat alternate, fruit, vegetable, green bread and dairy. A media briefing was held recently at the Newman Nutrition Center in Los Angeles under the auspices of the New America Media (NAM) to familiarize members of the press of the district’s Nutrition in Schools program. Participants also had the opportunity to observe the processes involved in the lunch preparation. The event was supported by The California Endowment. David Binkle, interim director of LAUSD Food Services Division (FSD), bared that the school program designed to increase awareness of childhood obesity and encourage healthy eating habits is immense in scope. The FSD provides approximately 650,000 meals every day served to 80 percent of the student populace who qualify for the free food. It is funded by the U.S. Department of Agriculture and, according the Binkle, the system is such that the more kids are served, the more is the program funded. 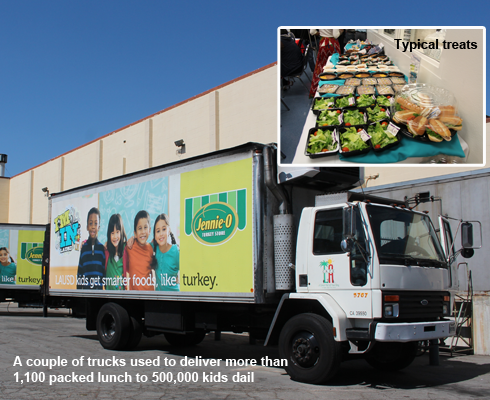 A fact sheet indicates that currently the Newman Nutrition Center, the FSD’s packaging facility, prepares 220,000 of the meals every day and distribute them to satellite kitchens. Overall, it says that 500,000 kids are served daily in more than 1,100 different schools. Normandie Nigh, CEO of A World Fit for Kids (WFK), expressed excitement about the progress of the program, which she described as remarkable and a model for the others schools in the country. She added that a healthy student will be able to focus more in her\his studies and excel academically in school. She urged teachers and parents to provide healthy food to the kids instead of candy or doughnuts and other junk food. Victor Carranza, a supervisor of FSD, said that it is crucial that everyone get involved because the job of encouraging kids to eat is very challenging and requires collaborative efforts from everyone. He was responding to information that some teachers object to food being served in classrooms because it would cut into the teaching time. The Healthy, Hunger-Free Kids Act of 2010 (HHFK) is intended to help transform school food environment in order to promote better nutrition and reduce obesity. The law constitutes the first major changes in the food program in over 15 years and considered important to the 32 million students who eat a school lunch and 12 million who eat a school breakfast each school day.